I love to cook with flavored olive oils infused with the taste and aroma of herbs and spices. Herb-infused olive oils make you make yourself are also wonderful hostess, holiday or housewarming gifts. WARNING: you cannot store oil-infused herbs, even in the refrigerator. You must use them within a few hours to prevent botulism poisoning. Herbal vinegars are safe to store in the refrigerator because the high acid content prevents growth of the toxin. You can easily cook up a batch of herb-infused olive oils at home at a fraction of the cost from specialty stores or your local market. 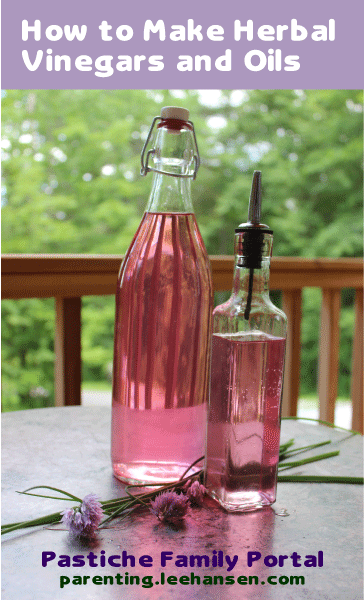 And it's even more simple to make herbal flavored vinegars at home for your own use to cook with or serve right after making. After you've mixed up your flavored olive oils you can bottle them in recycled wine bottles with new, clean corks or flip-top oil bottles and serve immediately. Treat oil dressings with fresh herbs as a once-and-done mixture to use right after making, then discard. If you love the results from these recipes, you might also enjoy making your own herb flavored vinegars. If you grow herbs in your garden, you've got a ready fresh herbs to make your own gourmet herbal olive oils you'll enjoy for cooking marinade, salad dressing or to serve straight from the bottle with fresh crusty bread for dipping. Making your own herb flavored olive oil dressing is easy and can save money over the prices charged at fancy food markets or specialty cooking stores. WARNING: do NOT store oil-infused herbs for any length of time, even in the refrigerator. You must use them right after making to prevent botulism poisoning. Organic olive oil, enough to fill the bottle or jar. Wash herbs, combine with peppercorns and pour into sterile bottle or wide mouth canning jar taking care to completely cover the herbs. Almost any herb you use to flavor salad dressings, marinades or fish, meat and poultry can be used to flavor your olive oil. Here are some examples of olive oil herb combinations you might like to try.